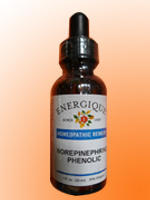 Norepinephrine, a neurotransmitter, is of great benefit for chronic depression and hypertension. We have seen effectiveness as well in tachycardia and hyperhydrosis (excessive sweating). Curiously, it seems to often help memory retention.